God invites us all to follow Him and be part of His beloved family. Pope Francis stressed this to the thousands of faithful gathered in St. Peter’s Square to celebrate the Feast of Saints Peter and Paul this morning. He presided over the Mass, at which the delegation from the Ecumenical Patriarchate of Constantinople was present. The Holy Father also invested the pallium on 30 Metropolitan archbishops. The pallium, a woolen cloak that is a sign of their office, is made from the wool of lambs blessed by the Pope on the Feast of St. Agnes. In his homily, the Holy Father reflected on today’s readings, noting they link us to the apostolic Tradition. Peter reacts to this completely unexpected announcement of what would happen to Jesus by saying: “God forbid it, Lord! This must never happen to you” (Mt 16:22). In this way, the Pontiff noted, he immediately becomes “a stumbling stone” in the Messiah’s path. To share in Christ’s anointing, on the other hand, Francis explained,means to share in His glory, which is His Cross. 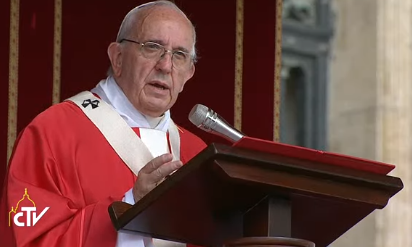 In Jesus, the Pope said, glory and the cross go together; they are inseparable.